You can cancel your Scout account at any time. We don't want to see you leave! We would love an opportunity to talk to you. Please contact customer support before canceling your account. To cancel your account, open the account drop down menu by clicking your name located in the upper righthand corner of any page. 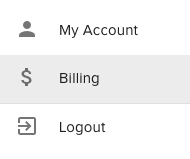 Select the Billing option from the menu. 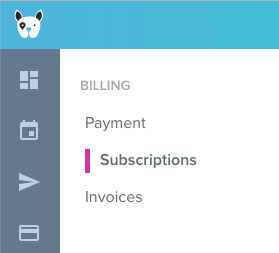 Select "Subscriptions" from the left navigation menu. Click the "Cancel Subscription" button in the upper righthand corner of the screen. Scout charges customers in arrears. After canceling your account, you will continue to have access until the 1st day of the following month at which time you will be charged for the current month's activity. If you cancel your account on January 10th, you will continue to have access to Scout until February 1st, at which time you will be billed for January usage. If you pre-pay for an annual subscription and cancel your account early, you will lose access to Scout immediately. You can reactivate at anytime during the plan year without incurring an additional fee. If you reactivate your account and it is still active at the end of the plan year, you will need to sign up for a new annual plan. Otherwise, you will be automatically enrolled in a monthly plan. What happens if I have monthly and annual plans? If you have both monthly and annual plans, you will continue to have access until the 1st day of the following month. If you reactivate your account, you will not incur fees unless you have more active staff than annual plans. If you go over your annual plans, new monthly subscriptions will be created. When your annual plans expire you will need to sign up for new annual plans. Otherwise, your account will default back to monthly billing. What happens if I signed up for Scout during a sales event? If you have a monthly discount and you cancel your account, your discount is also canceled. When you reactivate your account, you will be charged full price.